Vogue 6045; ca. 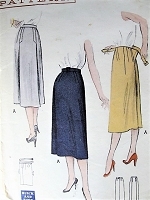 1963; Co-ordinates - Cape, Pants and Skirt. Circular cape has zipper front closing below attached hood or shaped collar. Vertical welt arm open. Regulation pants. 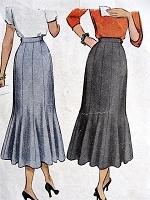 Slim skirt with opening in depth of center un-pressed pleat.